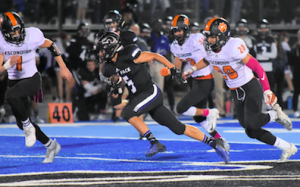 SANTEE – The conclusion of West Hills High’s football game with the Escondido Cougars appeared in jeopardy Friday night but there was no way the threatening weather was going to disrupt the Wolf Pack from carrying on with their Homecoming celebration. During the lightning delay at the end of the third quarter, school officials decided to have fans take cover in the gym. 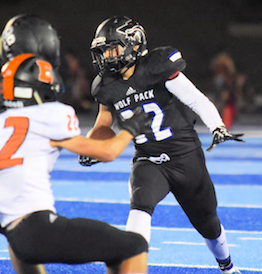 The Wolf Pack defense had pretty much ensured another victory – the team’s seventh of the season – when the bad weather came and West Hills leading 21-0 through three. So, rather than wait for the conclusion of the game, which was certainly in doubt with postponements happening throughout the county, West Hills decided right then and there to proceed with the Homecoming festivities. Before that, the Pack built a three-touchdown lead. The defense had six sacks overall, including two each by HUNTER GAUTHIER and TRENT OBERG. 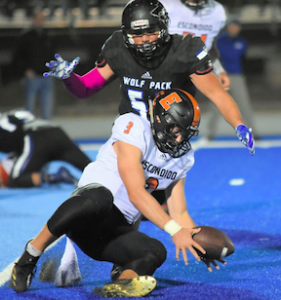 Meanwhile, senior quarterback JORDIN YOUNG was vintage Young, at this point, completing 9-of-14 aerials and executing his run game to perfection, as well. 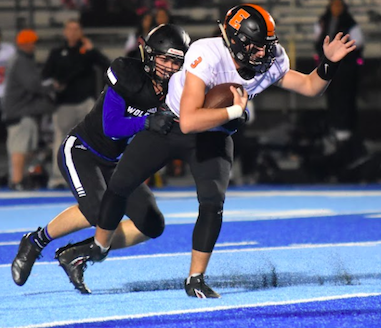 He accounted for nearly 200 yards of total offense, passing for a touchdown to Gauthier in the third quarter and rushing for an earlier score. JAKE MAHEU rushed six times for 63 yards and a score for the Wolf Pack. His 6-yard run opened the scoring in the second quarter. JACK BROWNING hit a 27-yard field goal for the Wolf Pack. TRAVIS DEAL caught a pair of throws from Young for 41 yards. One of the Cougars’ coaches designed a “JA” decal that both teams sported on their helmets as a tribute to long-time coach and teacher at West Hills, Jeff Armstrong, who passed away this month. Gymnastics legend TESSA ANDERSON is the Homecoming Queen while COLTON GROVER is the King. Next Friday night, West Hills (7-1) meets Mt. Miguel.